It's hard to believe, but somehow I made it to this point in my life without ever seeing SHANE. I think at a younger age I was put off because I erroneously thought it was a sad movie, perhaps because all I knew of it were the film's famous final words. As I learned more about the film, I felt sure I'd like it, and it became one of those movies I thought would be extra-special and wished to see at just the right place and time. I've occasionally done this with other films I've long wanted to see, such as THE CONSTANT NYMPH (1943); I wanted it to be an undistracted viewing when I could fully savor the experience and its expected impact. With half a dozen people and four animals in our house, sometimes those "perfect viewing" moments aren't all that easy to come by! Nonetheless, when I made a list of 10 classics to see for the first time in 2011, SHANE headed the list. And when I read it would be shown in 35 millimeter at the Autry in Los Angeles, I knew I'd finally found the perfect moment to see it. Today was the day, and hours later I'm still trying to process the experience. I loved it, I absolutely loved it. 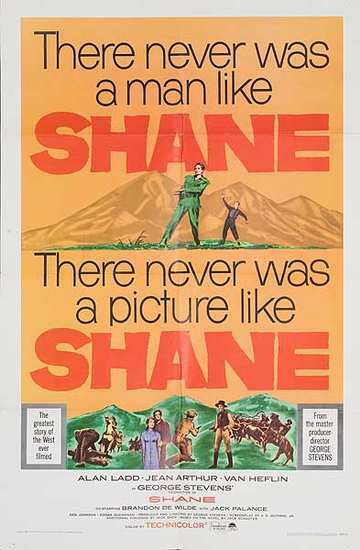 It's hard to know where to begin with SHANE, and indeed, the film is so familiar to so many people that there's probably not much need to say a great deal by way of introduction. 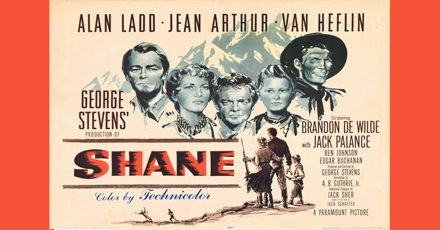 SHANE is the story of a range war between farmers, led by Joe and Marian Starrett (Van Heflin and Jean Arthur), and cattlemen, headed by Ryker (Emile Meyer). 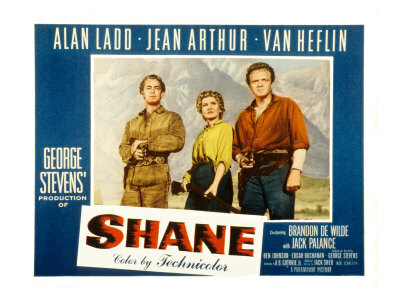 Shane (Alan Ladd), a mysterious loner, shows up at the Starretts' homestead one day and befriends them; he's idolized by the Starretts' little boy, Joey (Brandon De Wilde), and there's an unspoken attraction between Shane and Marian. 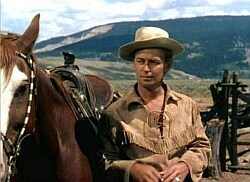 Shane ultimately battles Ryker's hired gun, the evil Jack Wilson (Jack Palance). That's the main thrust of the story, and yet it doesn't do the film justice. This is a beautifully made film which is as rich in substance as any great work of literature or art. Many moments linger in the memory, and it's clear there will be new things to discover on future viewings. I loved the barroom brawl between Shane and Chris (Ben Johnson). It was a superbly staged fight that looked real. Contrast it, for example, with the typical saloon brawl from an Errol Flynn Western, which almost looks like a choreographed musical number or stuntman's exhibition, and no one really looks hurt. In fact, that "realness" is one of the reasons the film works so well, in general. In every respect -- such as Brandon De Wilde's remarkable performance as little Joey -- the film feels authentic and as though it actually could have happened. One of the great little moments is when Shane and Jack Wilson size each other up over a dipper of water. You just know they know they're going to be shooting it out one day soon. During the final confrontation, I loved something as simple as the way Shane positions himself next to the bar. That final spin of his gun back into his holster is as exciting a cap to the film as Luke Skywalker successfully firing the shot to destroy the Death Star. The audience breathes a sigh of relief. One wonders why there was concern about Alan Ladd's height. It's not height that matters, but attitude, and Ladd's Shane has attitude to spare. Something that has always puzzled me about the film, dating to when I first saw stills from the movie, is Jean Arthur's mop of hair, which doesn't seem to "fit." I don't recall seeing another woman in the film with her hair in that sort of unkempt, boyish style and wish the filmmakers had chosen something else. That might be my sole criticism of the film, which in a backwards way illustrates the movie's strength in every area. One of the aspects I particularly enjoyed was the gradual transformation of the character Chris, played by one of my favorite actors, Ben Johnson. 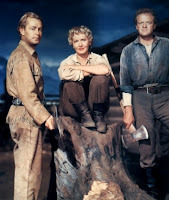 According to the moderator at the Autry, Chris was originally supposed to have a romance with Susan Lewis (Janice Carroll), the daughter of Fred (Edgar Buchanan), and that provided some of the motivation for Chris's change of heart. That part of the story was cut for time reasons, but the character still works, because Johnson is such an effective actor. Without a single word of dialogue, he conveys his guilt and disgust during two critical scenes late in the film. I was hoping there would be a followup payoff to those brief moments, and indeed there was. I'm sure many more such thoughts will come to me after I post this, and next time I see it, and the time after that. It's that kind of movie. I mentioned in passing last summer that director George Stevens was inspired by my favorite little town, Bridgeport, California, when he was designing the setting for SHANE. 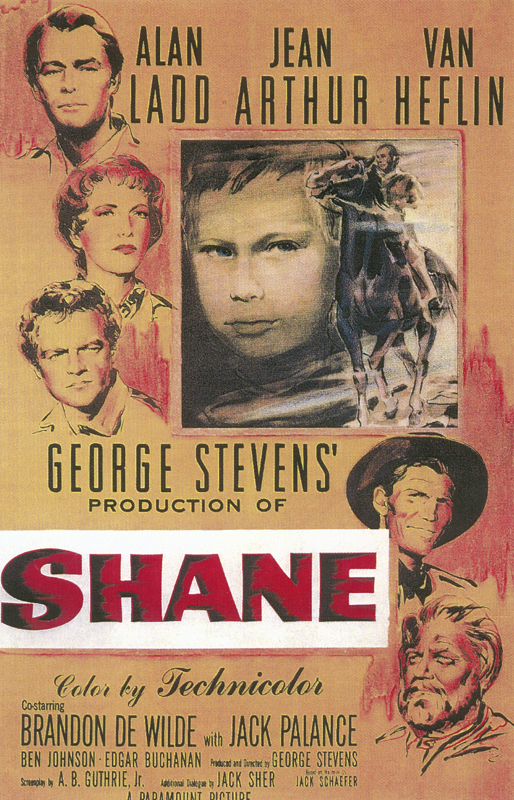 In the book GEORGE STEVENS INTERVIEWS he spoke about Bridgeport, which he said was "very unlike other California towns," and described how it influenced SHANE: "There was the funeral on the hilltop, and there was the distance where the cattle grazed, and then there was the town at the crossing, a western town like other western towns were. There were the great mountains that rose behind it. This was all arranged in one camera view... That worked its way into the picture from an idea that came to me in Bridgeport, a small town in California." 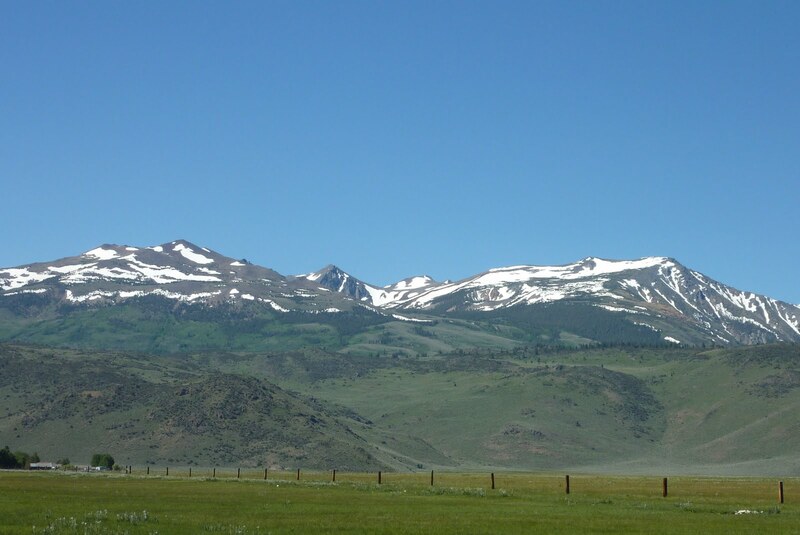 The meadows outside Bridgeport are pictured here. Loyal Griggs won a much-deserved Oscar for Best Color Cinematography. The excellent score was composed by Victor Young. The screenplay was by A.B. Guthrie Jr., based on the novel by Jack Schaefer. The film runs 118 minutes. The supporting cast includes Elisha Cook Jr., Ellen Corby, Douglas Spencer, John Dierkes, Nancy Kulp, and Beverly Washburn. Alan Ladd's children, David and Alana, have bit parts. 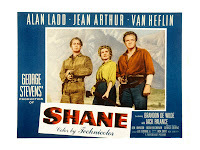 SHANE is available on DVD. Extras include a commentary track with George Stevens Jr. participating. It's also had a release on VHS. A re-release trailer is currently available on YouTube. The 35 millimeter print shown by the Autry was quite good much of the time, but far from perfect. The beginning of each reel was rugged, especially during the opening credits, and periodically a thin vertical colored line would appear near the edge of the screen. In this day and age when we're blessed with beautiful DVD prints and can also sometimes see restored prints on the big screen, it's a disappointment when a print has some issues. However, the overall print quality was such that it was worth the occasional distractions in order to see the film for the first time on a screen in 35 millimeter. 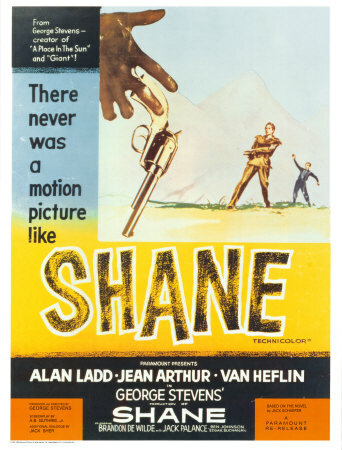 For more on SHANE, check out two excellent blog posts from earlier this year: "The Movie That Made Me Love Movies" by Caftan Woman, and a thorough, very appealing analysis by Jacqueline Lynch at Another Old Movie Blog. I waited to reread Jacqueline's post until after I wrote this, and as I revisited it for the first time in months I was impressed anew; if you love SHANE, by all means read it and enjoy her insights into the film. 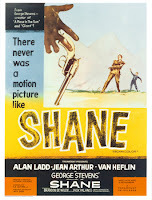 And if you haven't yet seen SHANE, please don't put off enjoying it as long as I did! "Shane" on the big screen? Oh, yeah. What an experience, I really envy you. Seeing this movie, especially for the first time, in such a way. Good for you. Also, thank you so much for the link. Couldn't agree more Laura! 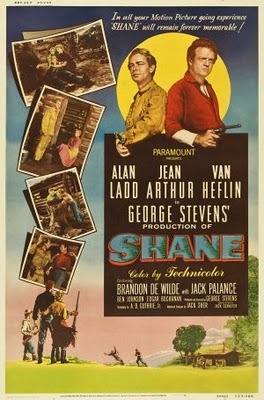 "Shane" is a Hollywood classic and deservedly so. Ps. BTW, for some reason, I just flashed on Cliff Robertson's "turn" as cowardly "villian-of-the-week" "Shame" in the original "Batman" TV series! BLASPHEMY!! I used to watch this film with my parents when I was a kid....I haven't seen it recently, but yes, it's great! I should re-watch it now that I know the actors (just reading Jean's biography I realized she was in it!). Loved reading your review and you're so lucky to had the opportunity to see it on the big screen! Sounds like a great experience, Laura. I saw Shane for the first time, myself only a few weeks ago and it was still impressive. I love the way Stevens shoots dialogue as well, a lot of varied angles and very careful blocking. I'm surprised you could concentrate on Jean Arthur's hair and not on the giant cloud of soft-focus that seemed to follow her everywhere. It wasn't quite on Star Trek levels, but it was close. My understanding is that Jean ARthur, who was much too old for her part, wore a full wig. As for Ladd's height, I don't think it was a problem for Paramount, only something nasty people in the business brought up in hindsight. Thanks to you all for your notes! It was a wonderful experience. And you're very welcome for the link, Jacqueline! Barrylane, Arthur was past 50, but she still looked younger (soft focus or not! ), especially considering she was playing a worn-out pioneer woman. I think they could have chosen a wig more a little more pleasing and perhaps it also would have been more historically accurate -- her hair pulled up in a bun or something like that -- and Arthur works fine in the part. It seems that the filmmakers actually used a number of tricks to try to hide Ladd's height, so they were concerned about the issue contemporaneously with the making of the film. Laura, they weren't concerned, only realistic. Lots of short leading men, then and now. It wasn't an issue, it's just the movies. The business of illusion. But my entire point, Barry, was that it was an issue to the filmmakers at the time the film was made, and I don't believe it needed to be because of the strength of Ladd's performance. 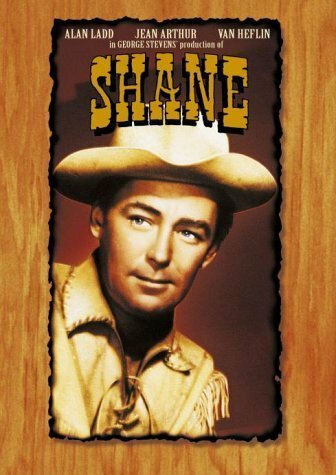 When my husband and I were dating, it came up in conversation that he had never seen "Shane". He claims the rest of our party looked at him as if he had just confessed to a murder. I know I was shocked, but I think he's exaggerating.